Dr. Markus Hellenthal has chaired the Berlin Conference 2012 National Security and Civil Defence on 28th and 29th of March 2012 in Berlin. New article by Dr Markus Hellenthal: Auf dem Weg zu einem Systemverbund Sicherheitsarchitektur, in: Crisis Prevention volume 1/2012, page 36ff. Dr Markus Hellenthal stands for customer or citizens oriented, innovative and mission critical solutions based on latest digital information and communication technologies, for the public sector in Germany and internationally. He has gained in over 30 years an exceptionally broad professional experience in senior executive positions, the first half in the public sector and the second half in the private sector. Since January 2016 he is Senior Vice President with Capgemini and leads the Public Sector business in Germany with a particular focus on public safety and defence customers on German and European levels. Before joining Capgemini, Hellenthal was since the beginning of 2013 Vice President with IBM and Business Leader Public Sector Germany, Austria and Switzerland. Prior to that he was Senior Vice President of the Thales Group and CEO & President of Thales Deutschland, where he was accountable for 7,500 employees and 1,4 billion Euro sales in Germany as well as for export. 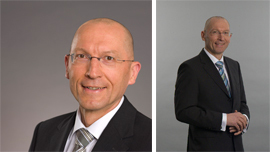 During this tenure he was sitting on the supervisory boards of ESG GmbH, Diehl AirCabin GmbH and Diehl Aerospace GmbH. Prior to that he was Senior Vice President of Airbus and a Partner with Accenture. Hellenthal has started his carrerr with the police and public services. Until he left in 1997, he was law enforment officer and Government official in Northrhine Westfalia and with the federal government administration, his final position being Director Federal Border Police being in charge of the division Border Police and Aviation Security with the Federal Ministry of Interior. In all functions he successfully managed strategic change programs and capability increases enabled by latest information and communication technologies. From 2004 through 2014, Dr. Hellenthal has participated to the foundation of the European and German security research agendas, having been the first President of the European Security Research and Advisory Board to the European Commission, and was part of it for over 10 years. In parallel he has been consulting the German Federal Ministry of Economy and Energy.